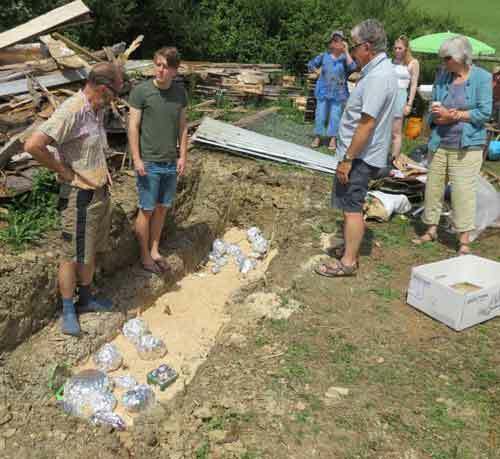 This page records the pit firing undertaken at West Bexington, Dorset in June 2018, by local potters Jennie Hanrahan and Bill Crumbleholme, with the assistance of members of their classes and the hosts Henry and Sue (and their tribe). Jennie's grand-daughter was fund-raising for her school trip to Kenya as part of an organisation that works with schools there, helping to fund and build classrooms. 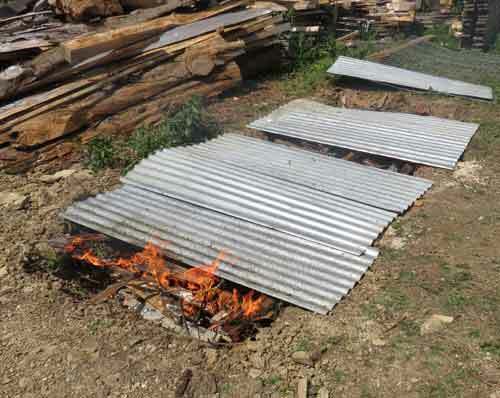 The proceeds from this pit firing event were going towards that cause. 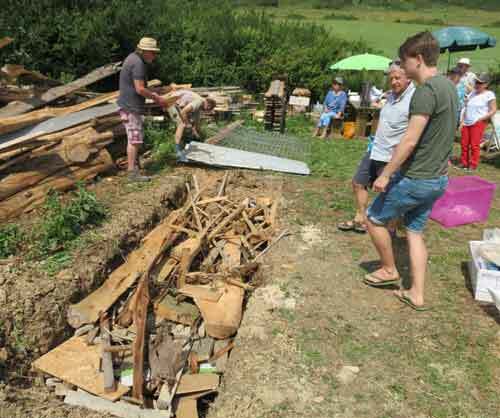 There is evidence of iron age pits in Dorset similar to this pit, used for firing a type known as Black Burnished Ware. 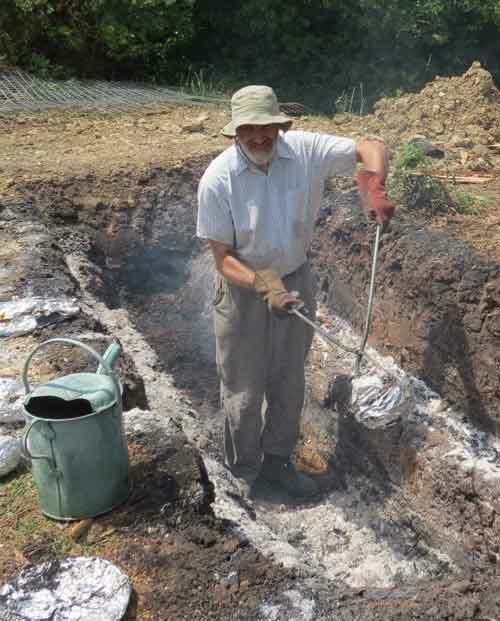 That was fired using the pit as a kiln chamber to heat up the pottery and turn it ceramic and then smoke blacken it. 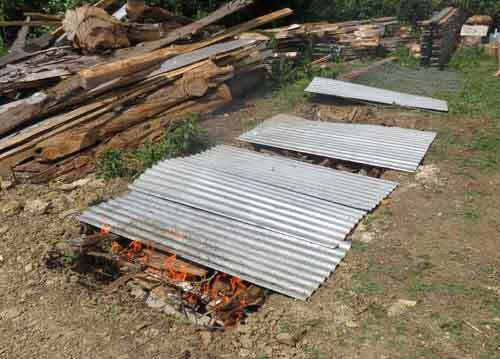 There is also some thought that drying sheds were used to pre-heat the raw pots to minimise explosions when being heated due to water turning to steam. 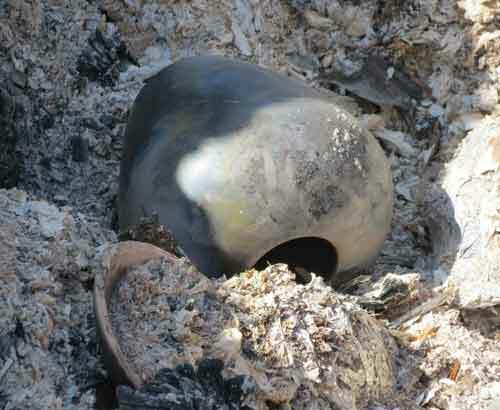 In this firing the pottery had previously been fired in electric kilns to turn it ceramic, this firing being done to enhance the appearance of the surfaces by introducing smoke and flashes of colour from burning other materials that wood. This is an archive of photographs taken before, during and after the firing, with some comments. 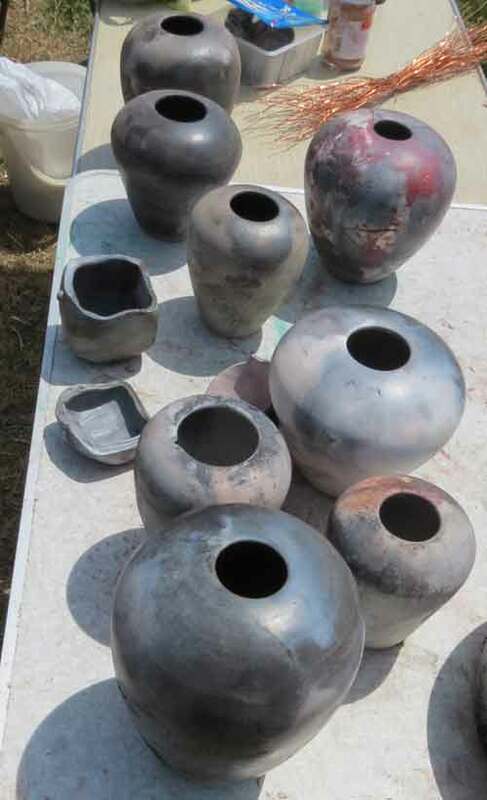 There are no images of the pots being made. 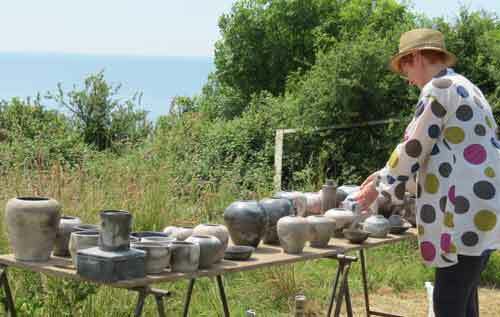 A batch of Globe pots were made by Bill Crumbleholme while demonstrating during the Upwey Potters annual show, as part of the Dorset Art Weeks Open Studios event. 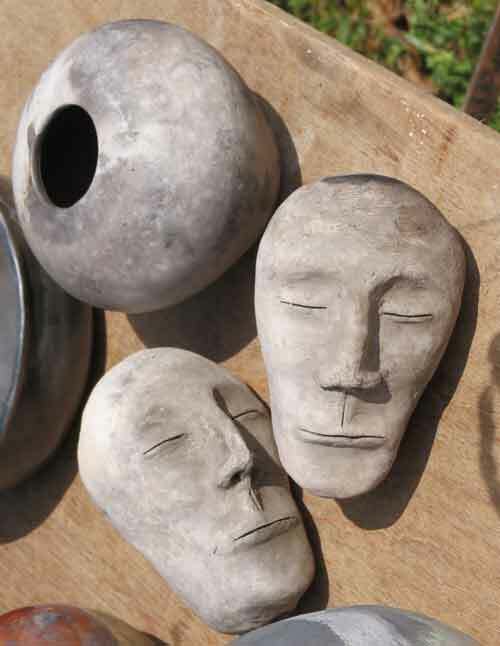 They were thrown using low iron stoneware clay AWS1G from Spencroft Ceramics. These were made available to class members for them to wrap and stuff ready for the firing. 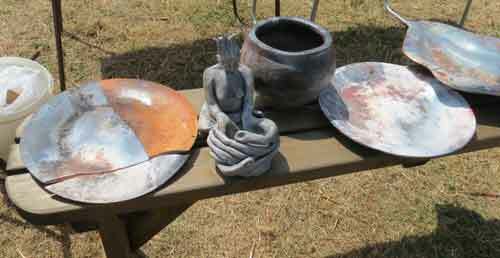 Members of the classes prepared various vessels and sculptures, using a variety of clays and "seasonings". 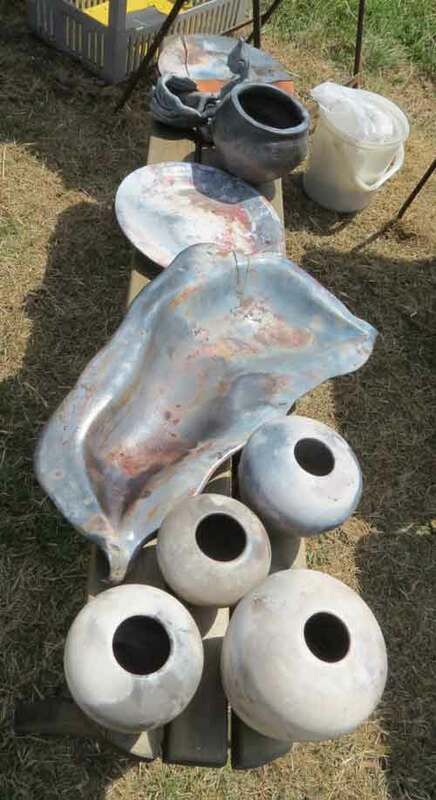 The pots were burnished while leather hard to smooth the external surface, this was repeated as the pots dried. Very fine Terra Sigillata slip was then applied in several very thin coats to the dry surface, which produced a super smooth finish. 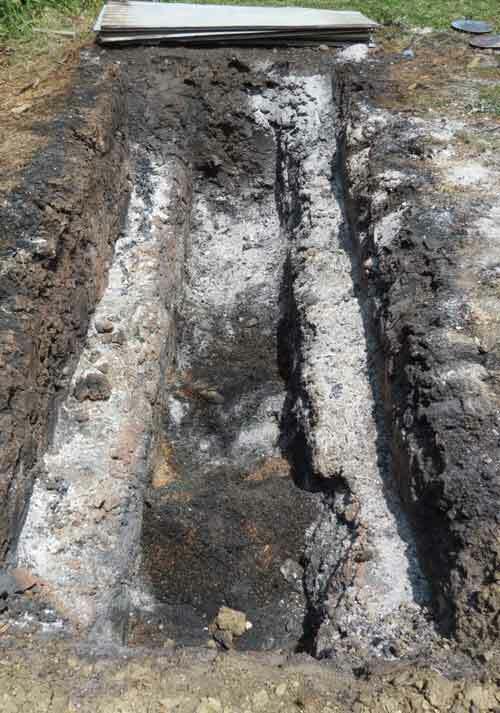 That slip was prepared using ball clay, mixed in water with deflocculants, after settling the larger particles sank and were discarded, the water that floated up was also removed and the middle section used as the slip. 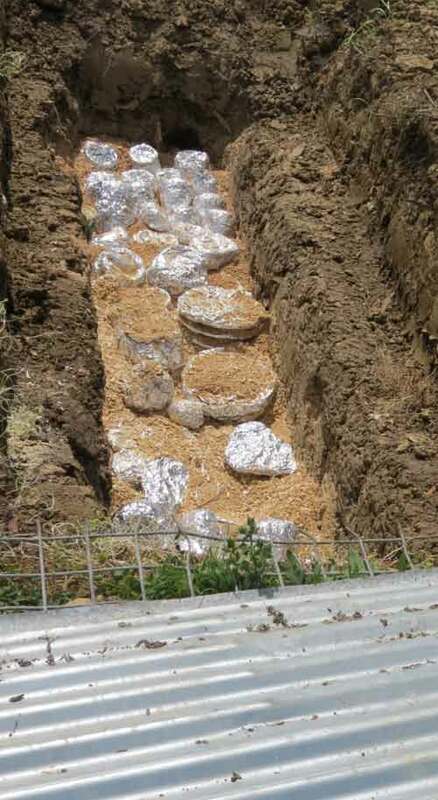 The pit, lined with sawdust and wood shavings, with a layer of pots bedded into that. Jennie and family preparing more pots for the fire. 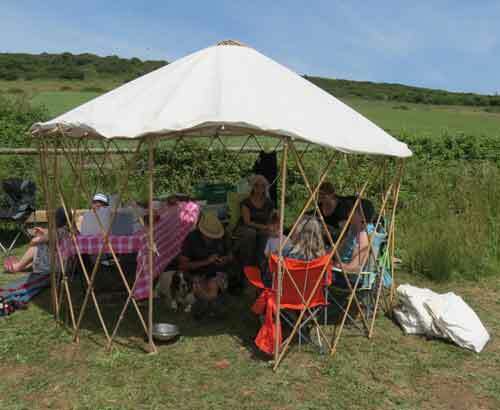 Bill's yurt provided much needed shade and a space to chill out and eat cake. The first layer of pots, with more sawdust tripped over, ready for another layer. 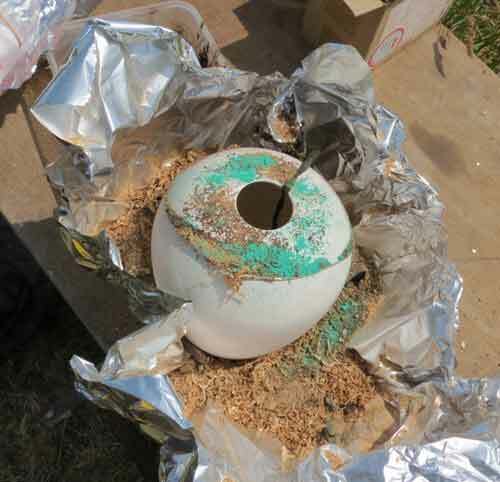 The aluminium foil was lightly folded around the vessel, then the gap was filled with a variety of combustibles and materials likely to provide flashes of colour. 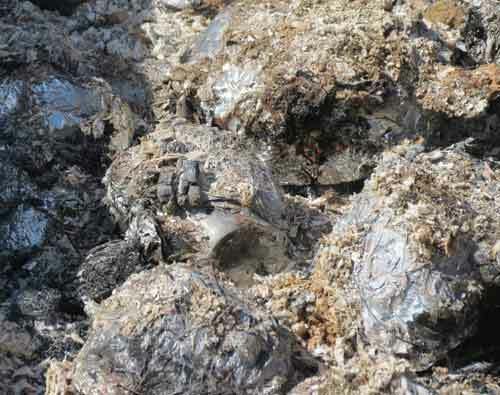 These included seaweed, coffee grounds, bay leaves, bark, sawdust, iron oxide, copper carbonate and several other substances. 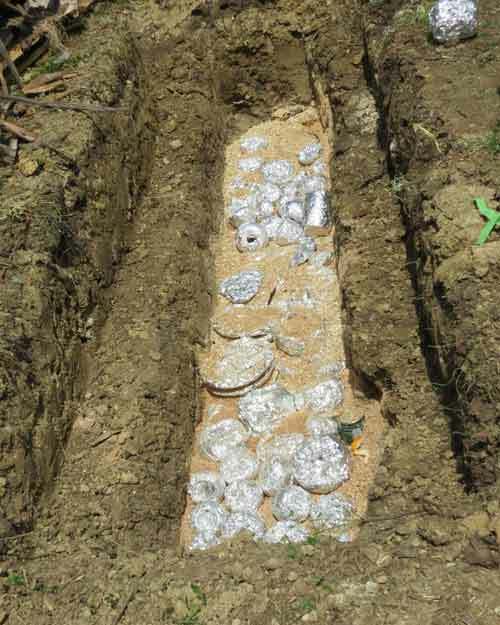 The foil was then wrapped up tighter and copper wire was wrapped around it to hold it in place. During the firing the foil starts to break down and become paperery. Gaps in the foil allow air access to the pot, which may burn away some of the etched in smoke, returning the surafce to it's original white colour. 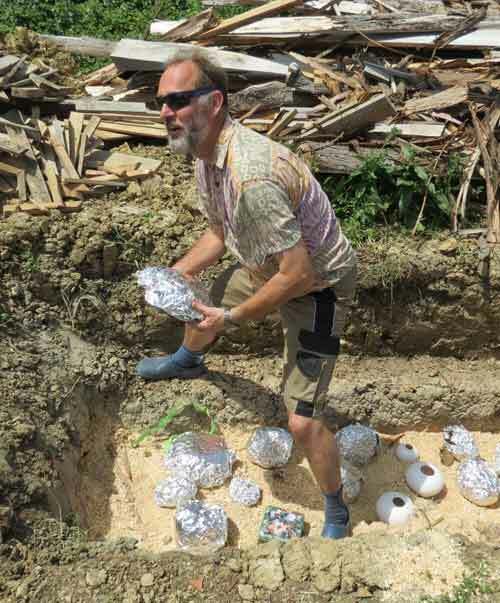 The second layer of pots placed in, almost reaching up to the stepped platforms at the sides. 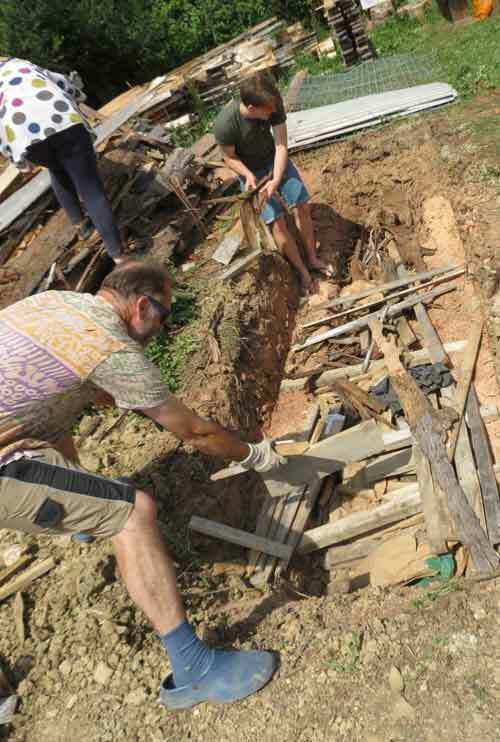 Carefully stacking timber over the pots. 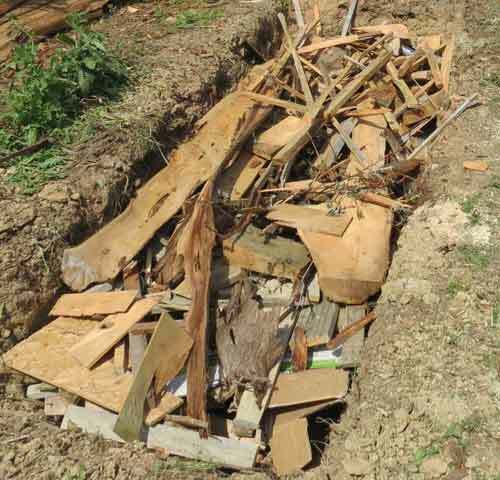 The timber was various sizes and shapes. It was loaded up until it reached ground level. 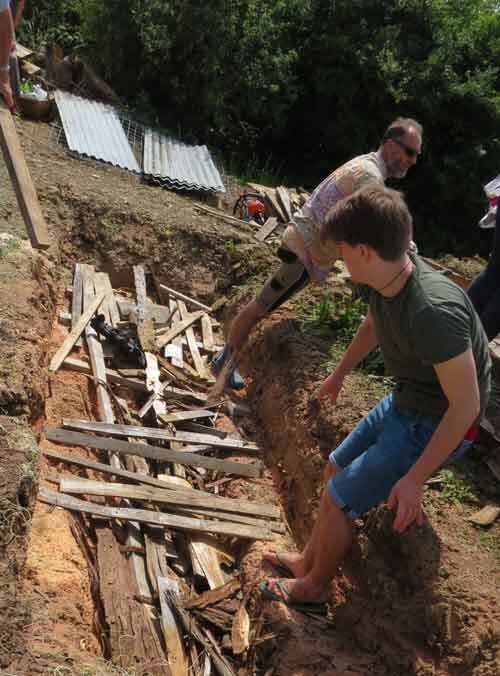 Corrugated iron sheets were placed across the pit, with spaces left at both ends and in the middle. BBQ lighting fluid was squirted on the wood and a gas torch used to set light to that. 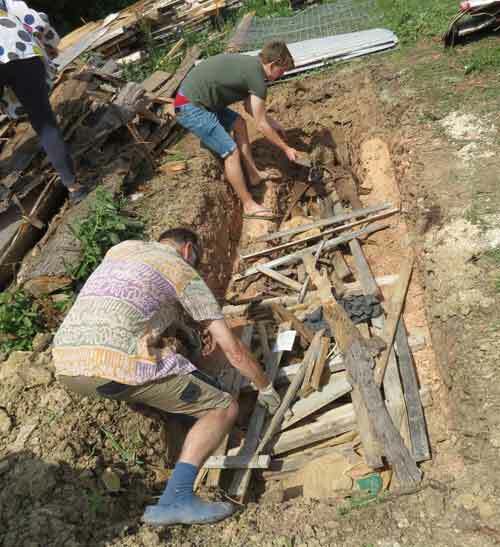 There was a slight breeze, which encouraged a through draught, with one end being the entrance for combustion air and the other end acted as the chimney where smoke rose out, helping to create a suction and increasing the air flow and thus heat being generated. The iron lids kept the heat of the flames within the chamber, rather than letting it escape too quickly. 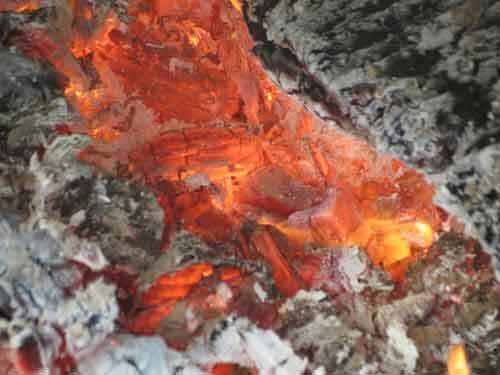 The glowing fire inside the chamber, about an hour after lighting. 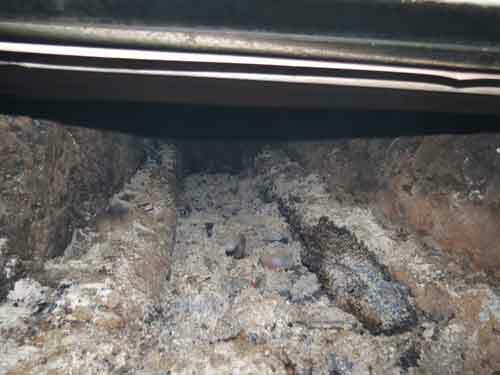 A closer look at the burning wood and sawdust. 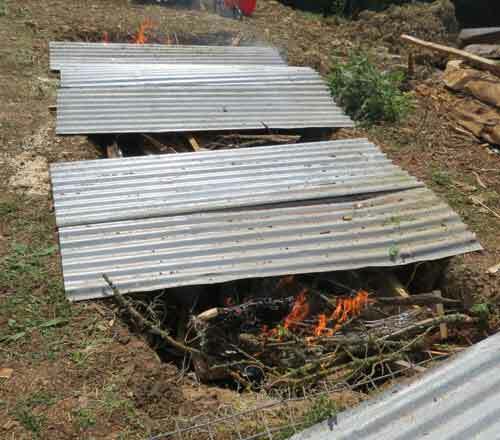 After an hour and half burning, the flames subsided somewhat and so the gaps at the ends were closed over. 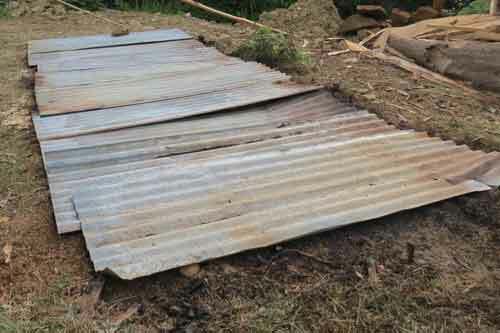 There were small gaps all around the iron sheets, so a small amount of air could seep in to feed the smoldering fire. A hand-held Infra-Red temperature measuring gun was used to check the sort of temperatures reached. It is not a very accurate device in these circumstances, without a good flat target for the beam to register on. 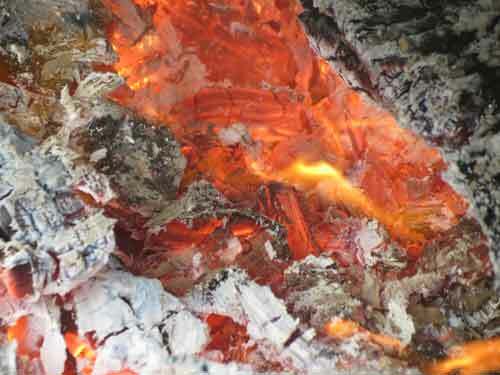 During the major burn the reading was up around 900C over most of the pit's contents. By late evening the reading was down to between 400 and 500C. 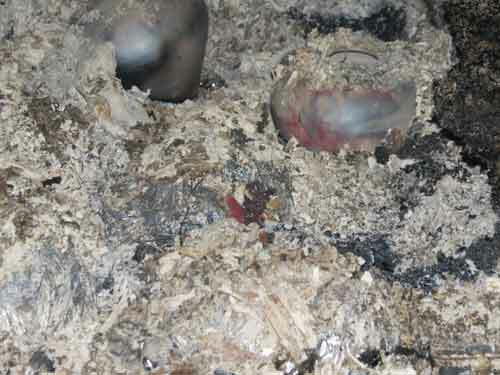 Peeking into the chamber late at night revealed some pots sticking up out of the embers. The flames had died away, but there was still a steady glowing. 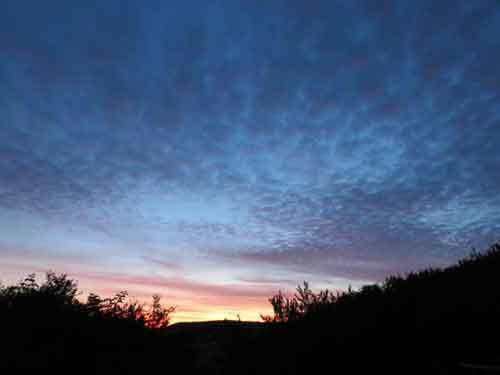 By the next moring the temperature had dropped to about 200C or cooler. 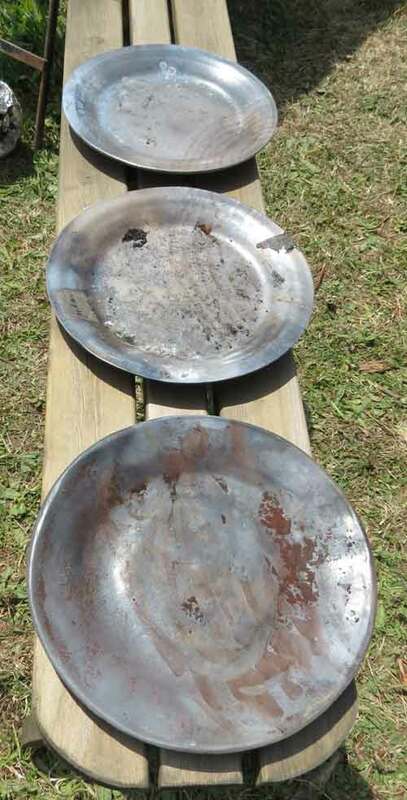 The iron lids were removed to speed up the cooling. 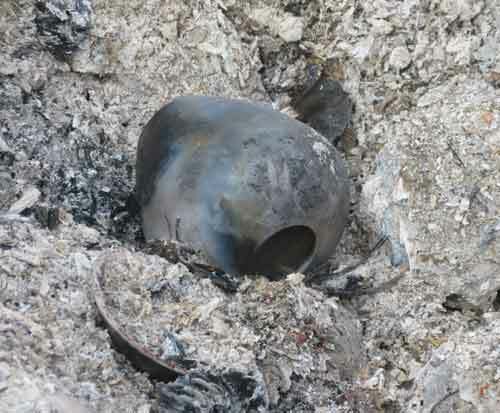 Close up of pot exposed within the pit, as the embers and ash drop away. Bill in the pit, unloading the last few packages. The watering can was to damp down the ground he was standing on, after the soles of his boots began to melt! 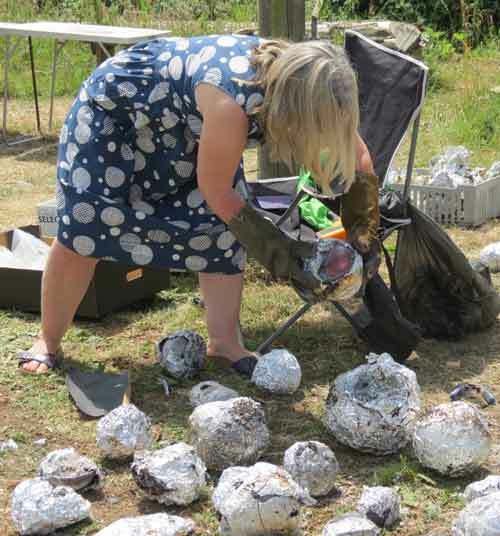 The raku firing tongs were very useful for lifting out the pots, without having to bend down too much into the carbon monoxide! 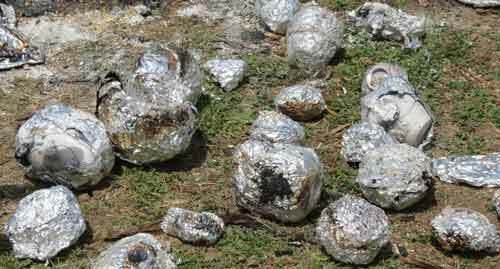 The aluminium foil was carefully removed to reveal the pots' surfaces. 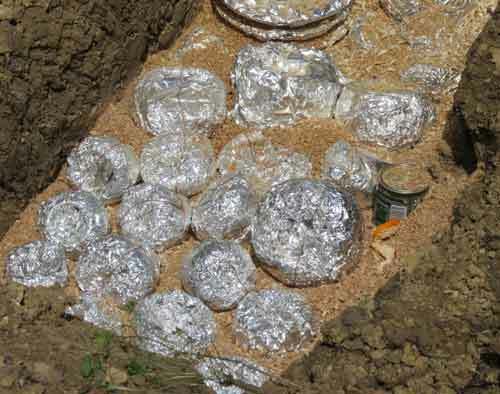 Some of the foil was almost baked away, some was barely affected - showing a range of temperatures, with the lower pots staying cooler where buried in sawdust that had not burnt very fiercely, being protected by the pots? 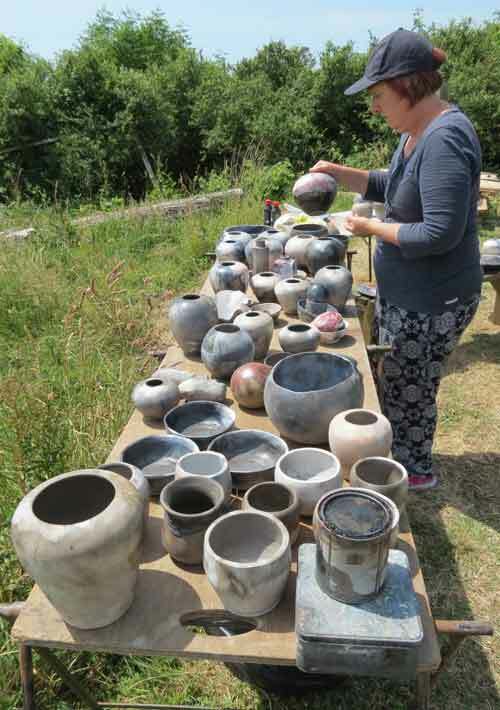 Jennie sorting out the cleaned up pots. A field of packages cooling down awaiting unwrapping. 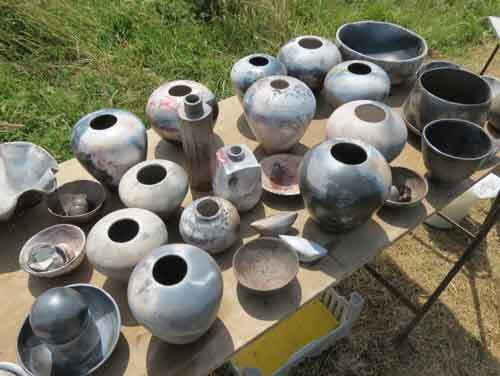 There were no broken pots from this firing - except the ones that went in already broken! The flashes of colour were good on some pots, if a bit subtle in places! The grey-scale smoke etching was good. There were few surfaces that stayed white (or were reverted by burning off). 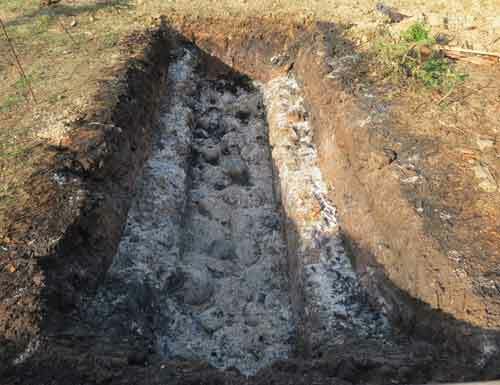 The results were generally considered very good, for the first attempt at pit firing on this large scale. 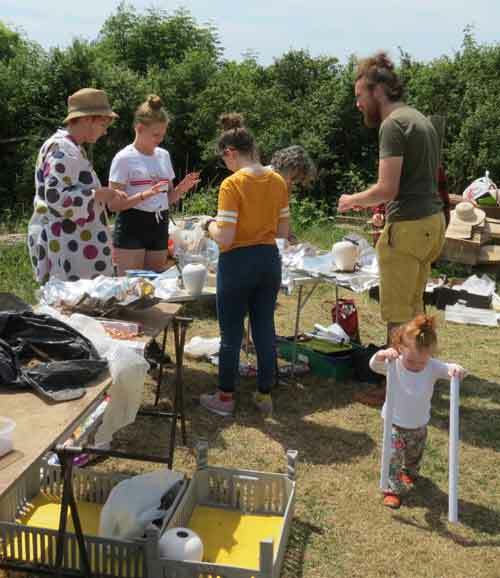 Henry and Sue at West Bexington, together with their families and friends, for being willing volunteers/slaves! All the class members who joined in the project, making and helping with the firing.